No, I haven’t forgotten about this project. How could I? ;) This sake was what I enjoyed last Sunday night, after enjoying those cream puffs in the afternoon. BTW, I don’t remember if I mentioned this before, but I do make moderate use of what we call “2 channel,” a Japanese internet forum conglomerate(?) which is said to be the largest in the world. (Now I’m so happy that English Wikipedia has this nice coverage of 2ch! :D) When I started this “Sake to Sakana” series, I stepped into the wild jungle of 2ch and found a couple of extremely informative forums about sake and appetizers. Those threads are still my favorite and I browse them once in a while. This sake, Kubota 久保田 was one of those brands that so many people recommended to sake beginners. Also Mr. John Gaunter includes this Kubota in his list of “super popular sake” on his wonderful site, Sake-world.com. So I had been wanting to try this brand for quite a while, and I almost jumped with joy when I found 720 mL bottles of Kubota at EAON shopping mall. Unfortunately what I found was “Senju　千寿” rank of Kubota, the less expensive honjozo 本醸造 version, not ginjo 吟醸 or daiginjo 大吟醸. 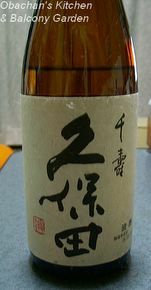 (The junmai daiginjo 純米大吟醸 version is named "Manju 萬寿 Kubota", and costs apx. three times more.) But I was determined to try the one I found anyway. The impression I had at my first sip of this Kubota was “Gosh, this is SWEET!” It was almost “creamy” sweetness that I had never tasted before. The distinctive (at least, to me) sweetness was followed by a pleasant sensation right after, which I liked very much. But I couldn’t help wondering, “Is this what they call ‘light and dry’?” because the impression of the sweetness was too strong. Then I warmed it, as I always do to see the changes in the taste at different temperatures. It WAS interesting. I think first I warmed up this sake to be a little warmer than body temperature, and I thought I felt the sensation stronger than the sweetness. Then as it cooled down to be about body temperature or a bit cooler, it got to the point where the sweetness and the sensation were felt almost simultaneously, making a very pleasant harmony. So my conclusion is: I like this sake lukewarm (Nurukanぬる燗). This is an appetizer made with salmon, which I don’t know how to call. I saw it on TV Saturday morning and immediately decided to try it out, because everyone appeared in the program said it was great. I gave it a little twist of my own, though. Chop samlon fillet in small chunks. Slice Shironegi. 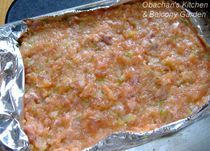 Mince salmon and shironegi together until they turn into a coarse paste. Add the seasonings (miso, mirin, sake, light soy sauce and corn starch) and mince and mix. Repeat scooping up the paste with the knife and pushing it down onto the cutting board, until the seasonings are evenly mixed with the paste. 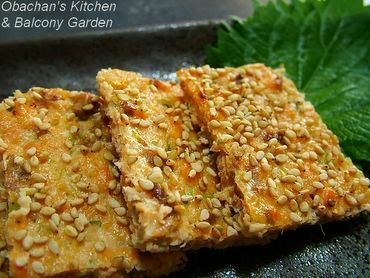 Spread in a baking sheet or something lined with aluminum foil, sprinkle with white sesame seeds and bake until the top is appetizingly brown. Remove from the baking sheet, remove the foil and cut in rectangles. 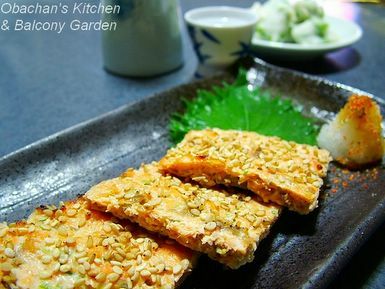 In the TV program, they used miso only, but I wanted to add a little sweetness with mirin and sesame seeds. It might be good to sprinkle shichimi or sahsho pepper on top for extra flavor. 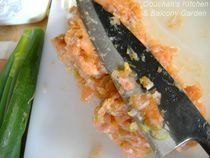 I guess you could use food processor instead of mincing with a knife, but they say the knife-and-cutting-board method would bring out the salmon flavor better. Another appetizer I enjoyed that night was this edamame-ten -- my recent favorite. 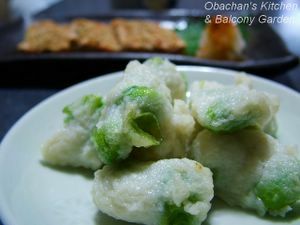 It is edamame (green soybeans) mixed in white fish paste and deep-fried. Unfortunately this is not home-made… it’s one of the fish-cake products they sell at supermarkets. But it is so good with the natural sweetness and crunchiness of the beans. hi..can u pls post e cream puff recipe? 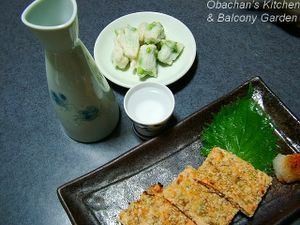 it does look delicious..
Hi Obachan! The food looks absolutely delicious and the photos look really fantastic! :) Makes me really hungry. I love sake too. But I usually don't know which is good. (I only know when I taste it whether I like it or not!) So sometimes when I feel like splurging, I'll get the middle-range expensive ones. :P Next time I'll post a pic of the one I always buy home to drink! Do you always cook for yourself only? Thanks Obachan, I'm hoping to find Kubota sake here in Los Angeles. Oh, and I'm definitely going to try the Salmon dish as well. Please share more of these simple dishes when you come across them! Oh, that salmon recipe looks great - thanks so much for sharing. We call Shironegi "green onions" or "scallions" here in the U.S.
whoa! what a decadent post, obachan:-) i can't tell you how much i appreciate the 2ch wiki link. i had posted many times on it, using an English-to-Japanese translator, back when I was discovering old Japanese pop. (the anonymous nature IS very easy for a non Japanese-speaking "foreigner" to participate.) it IS an amazing treasure trove, and opened up my eyes to all kinds of expertise, knowledge, as well as lots of extremism (haha)! on the health part: how about almonds with sake? do you like nuts? Hi lysithea! I know. Reg. sake, it’s extremely hard to say which is good and which is not. There’s such a great variety and everyone has his/her own preference. Yeah, I usually cook for myself only, except when I stay at my parents’ house. Thanks. Good luck with the Kubota hunting over there. ;) Yep, I’ll try to share appetizer recipes as much as possible. REALLY?! Gosh, I’m definitely feeling better! :D I wonder what type of sake you drink with Cheetos… dry type? BTW, as I mentioned on top of this post, I don’t recommend sake-drinking to minors. You’re welcome. And thanks for the info. Can you help me a little more with the English name of negi. We call these two types of negi with different names. The left one with longer white part is called Shironegi and the right one with longer green part is Aonegi. Are they both called "green onions" or "scallions" in the U.S.? Or how do you make distinctions? Here comes another 2channeller. ;) I don’t like everything about 2ch … I hit browser crashers several times before… but I have to admit that there are many great threads that you can’t find anywhere else. The one that made me cry was “Omoide ni Nokoru Shokuji 思い出に残る食事” – It became so popular that it was published as a book later. And I love some Ascii Art characters. I love almonds. Next time I might try something with almond. Thanks for the idea. I can't shed any light on the shironegi. 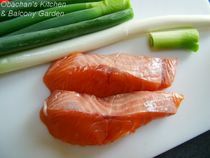 In Australia they would fall somewhere between what we call leek (which is tighter layers and stronger flavour), and spring onions ( like aonegi). I love shironegi - especially in nabe/sukiyaki. 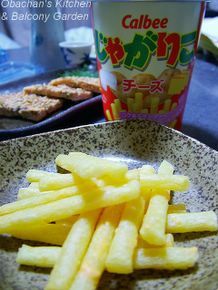 They have a deliciously sweet oniony flavour, and the flavour goes well in the dishes I mentioned! I think if I found them in a supermarket at home, they would be called some variety of leek. 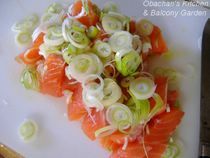 Obachan, I tried the salmon recipe last night, it was very good! I actually added a bit finely diced mushrooms to it, and I liked it. Maybe the salmon I got wasn't too fresh, as it had a hint of fishiness to it. I'm wondering what I should use next to time to cover up the fishiness, maybe a bit more sake? Oh, you tried Kubota Manju?! Lucky you! Yeah, I’ve read some online reviews by Japanese people saying it was so smooth. Mmmm… hope I can taste it someday. Hi! Thanks for the pic. This sake is made in the northern part of Japan. I’ve never tried it. But it sounds like a smooth sake which is not too dry. Adding mushrooms is a great idea! I’ll give it a try next time. For reducing the fishiness, I usually use a dash of sudachi (or lemon) or some kind of pepper, such as shichimi or sansho right before I eat.